Controliss are a new brand selling high quality remote control blinds at affordable prices… which is quite a new direction in the blinds industry. The beauty of remote control blinds which are identical to normal non electric blinds is that they are easy to operate from your chair, and don’t have messy chords which have been criticised recently as being a safety hazard in light of some recent freak and terrible events with loop blinds. We have taken on the already existing web design and are redesigning the interface for conversion, here is the new design for the homepage that focuses on selling the benefits of the product range. As well as improving the design and funtionality of the site to sell more blinds we are improving the search engine position of the site and the representation of the product focussing on Venetian blinds, Vertical blinds, Wood blinds, Roller blinds & Roman blinds. 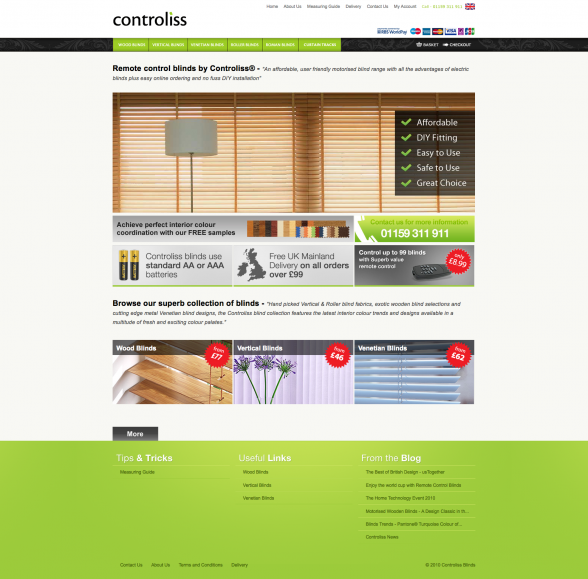 Controliss offer unique range of product with incredible value, visit the site to see the ranges… over the coming weeks you will see changes to every page of the site to improve the navigation and representation of the product to benefit sales for Controliss.